A paranoid schizophrenic involved in a minor road accident has been found guilty of manslaughter after he violently stabbed a pensioner 39 times near Worthing. The jury at Lewes Crown Court on Monday (16 May) found Matthew Daley, 35, guilty of the manslaughter of 79-year-old Don Lock, on the grounds of diminished responsibility. Daley was charged with murder on Sunday, July 19 last year and his trial at Lewes Crown Court started on Tuesday, May 3. Daley admitted killing Mr Lock but claimed it was in self-defence. However the jury heard Daley had suffered with mental health problems for many years and although he believed he saw Mr Lock looking angry in his car this was part of his delusion. Witnesses described Mr Lock as being very calm and Daley carrying out a frenzied attack. Mr Lock died at the scene from his injuries. He will be sentenced on July 8. 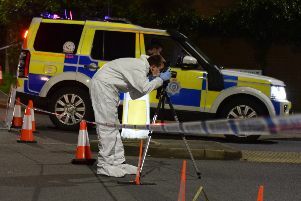 Detective Chief Inspector Paul Rymarz, who led the investigation for Surrey and Sussex Major Crime Team, said: “This is a tragic case for all those involved. Both families have had their lives changes forever. “I’d like to thank the investigation team, who worked on the day to trace Daley, and who have worked so hard since to bring this case to trial. At around 8.40pm on Thursday, July 16 last year Don Lock had left his cycling club meeting at Washington and was driving home to Worthing in his Toyota Auris, following Daley in his Ford Fusion. Outside Rogers Farm on A24 at Findon, Daley braked and Mr Lock collided with the back of his car. The crash caused only slight damage to each car. Both men got out of their cars but Daley was armed with a knife and stabbed Mr Lock 39 times in what witnesses have described as a ‘frenzied’ attack. Daley then drove to Woodland Stables and hid his car in the stables courtyard before changing into running gear in a lane close to the stables. He ran to his friend’s house in Exford Walk in Worthing, where he stayed for a couple of hours. He didn’t tell her what happened. He then returned to his flat in St Elmo Road and washed his clothes. However in the early hours Daley left his flat again. He tried to go to Sompting Church but found it locked. During the morning Daley phoned his mum Lynda Daley and confessed to her that he had killed someone. They arranged to meet. By this time there was a manhunt for the person responsible, with only a description of the man and a vague description of the car. Officers were gathering evidence from the scene and descriptions from those who had seen what happened. Police then received a call from Lynda Daley who told them about the confession from her son and officers went to meet Daley where he had arranged to meet his mum. At 2.02pm on Friday, July 17 at Hill Barn Golf Course, less than three miles from the scene, Daley was arrested. He had a rucksack with him containing the knife. During his interview he told detectives where he had parked his car at the stables and where he had hidden his wellington boots in Pot Lane and his underpants in Water Lane.